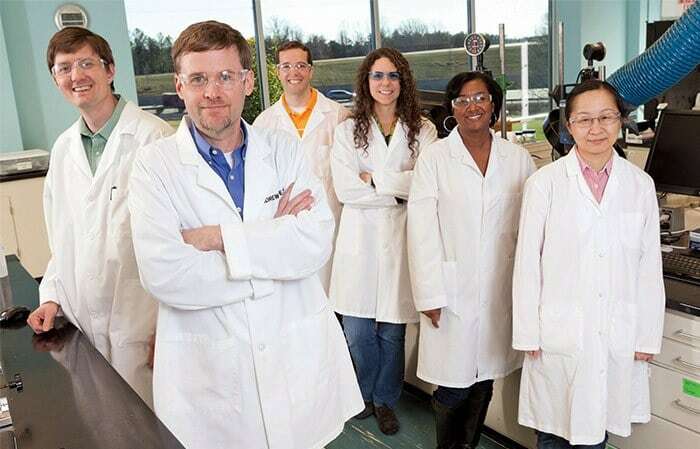 Members of the Syngenta formulation team work in the lab to make sure the products delivered to growers perform exceptionally well in the field. From left to right: Matthew Cottle, Andrew Pearson, Adam Voisard, Katie Oshige, Felisha Vestal and Xinyun Wen. In the world of crop protection, the active ingredients in products are what dominate much of the discussion—and for good reason. At the most basic level, active ingredients are the molecules that effectively control target pests. However, active ingredients are rarely, if ever, applied to crops independently. Doing so would be akin to eating pure sugar instead of candy, says Andrew Pearson, formulation & analytical development manager at Syngenta. Growers can only fully realize the potency and efficacy of these molecules when scientists deliver active ingredients within carefully designed formulations. It should come as no surprise that formulating crop protection technologies has become increasingly complex in recent years. As certain insects, weeds and pathogens have adapted to molecules once used to control them, delivering additional modes of action in a single product—via multiple active ingredients—has become imperative. Adding to this complexity is the fact that the active ingredients within a formulation often differ in form or property. Combining solids and liquids, for example, is a typical challenge chemists and engineers face. Formulation testing helps make sure the product growers receive can stand up to real-world scenarios. “Any time we are developing a formulation with at least one solid active ingredient and one liquid active ingredient, the process is difficult, because degradation is natural in that state,” says Matthew Cottle, Ph.D., group leader for herbicide formulation development at Syngenta. It is, as he says, a matter of making the incompatible compatible. “When you really think about it, a lot of what formulation chemists and engineers do is fight gravity, by manipulating how solids and liquids interact,” adds Adam Voisard, a formulation engineer at Syngenta. Syngenta excels at overcoming these challenges. Take Acuron® corn herbicide, for example, a much-anticipated weed-management tool introduced in 2015. Designed to combat grasses and the tough broadleaf weeds that have become increasingly resistant to glyphosate, Acuron herbicide is a premix with four active ingredients. Deploying new active ingredient bicyclopyrone was just one obstacle in formulating Acuron herbicide, says Xinyun Wen, a formulation chemist at Syngenta. Making this HPPD inhibitor compatible with three other active ingredients—mesotrione, S-metolachlor and atrazine—was also a significant stretch. “Mesotrione is a solid that doesn’t like to interact with S-metolachlor, which is a liquid, so that combination presented significant challenges from a stability and solubility standpoint,” says Wen. In rounding out the formulation with inert ingredients, chemists relied on an extensive database of information relating to surfactants to ensure compatibility with the active ingredients. Developing a formulation in a beaker is one thing, but producing enough of it to fill large-capacity storage tanks is another. After formulation chemists develop a recipe for a specific chemistry, formulation engineers scale up production. "The real world has a lot of curve balls, so it’s important to anticipate how those challenges might affect the product’s performance and usability." To preserve the original formulation’s performance and quality during large-scale production, the formulation engineers may adjust certain operational elements—like mixing speed or the order in which ingredients are added. Rigorous formulation testing efforts also help make sure the product growers receive can stand up to multiple real-world scenarios, such as exposure to hot and cold temperatures, transportation, tank-mixing with other products, and use with various types of bulk and spray equipment. “The real world has a lot of curve balls, so it’s important to anticipate how those challenges might affect the product’s performance and usability,” says Voisard. The formulation team’s work doesn’t end after product registration. Syngenta continuously looks for ways to improve existing formulations, as is evident in its growing product pipeline. For example, upon registration, Force® Evo insecticide will be compatible with starter fertilizers . Additionally, it will have excellent cold tolerance and improved flowability and cleanout. This easier-to-load liquid formulation is also well-suited for high-speed planters.